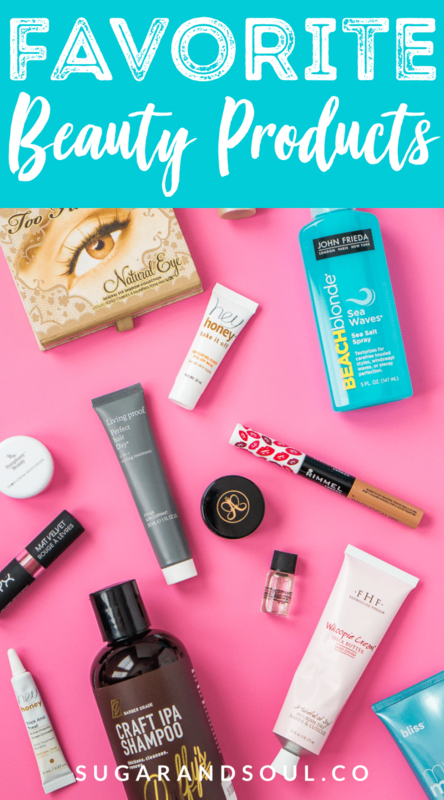 Looking for some great new beauty products to try, here are some of my favorites right now! 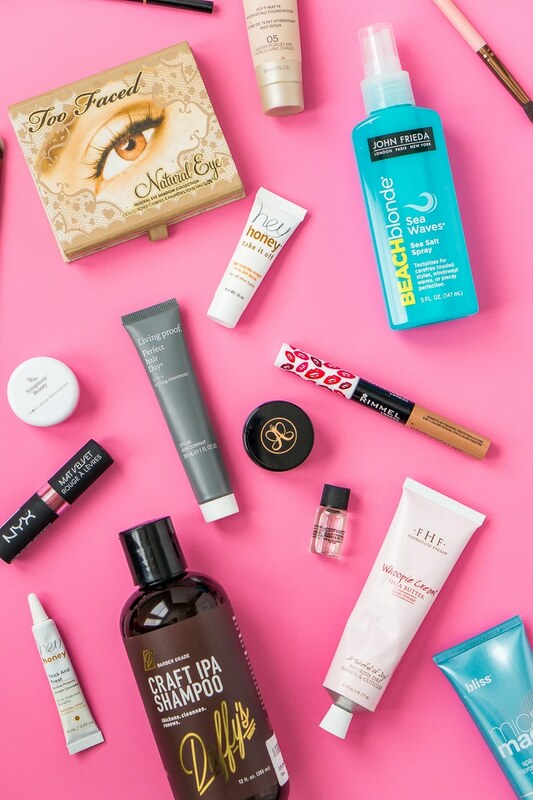 I’m a sucker for lists loaded with great beauty products because I love trying new things! And It’s been awhile since I shared some of my favorite beauty products so I figured it was time, especially since I found a lot of really great ones recently and I feel they deserve to be shared with all of you! When I say beauty, I’m talking about makeup, skincare, tools, and hair products – all of it! So let’s dive in! Urban Decay Perversion Mascara – I’ve tried a lot of different mascaras over the years, but this one is by far my favorite! I’ve actually been using it for almost 5 years now – which is kinda crazy since I love trying new products. And yes, I’ve tried sample mascaras here and there, but they just don’t compare to this one! NYX Velvet Matte Lipstick – I’m ultra in love with this lipstick. The matte finish is amazing and my favorite color is Soft Femme, I wore it in our Paris Photos and Baby Announcement Photos. Paired with the NYX Suede Matte Lip Liner (I pair the Cherry Skies with the Soft Femme), this lipstick will make you feel like a million bucks, but it will only cost you $7! It’s long lasting too! Trust Fund Beauty That Glo Tho Highlighter – I love a good highlighter to brighten my look and this one is one of my favorites, it’s got a hint of bronze which makes it great for summer and I find it blends beautifully with my blush and bronzer. It Cosmetics Bye Bye Pores Finishing Powder – If you are looking for that air-brushed finished, I absolutely love this finishing powder. They have a loose powder form as well, but I find that the pressed seems to last longer. This powder also doubles as a blotting powder and is great to keep in your purse for all-day touchups. This brush is great for applying it. Too Faced Natural Eye Shadow Collection – I’ve been told by a few makeup artists that when it comes to eyeshadow, the brand doesn’t really matter so much. Eyeshadow is eyeshadow. So even though this is a pricey little palette, I really love the colors! I love that they layout the three different looks, but I actually tend to mix all three, my usual go to is a base of Heaven, a touch of Silk Teddy, and a corner/crease of Cocoa Puff. Maybelline Dream Velvet Soft Matte Foundation – I’ve tried a lot of foundation even the super expensive ones, but I always seem to come back to the Maybelline Matte line that I’ve been using since high school. I used to use the mousse, but now I use the cream. I love that it provides an even all-over finish that’s lightweight and not at all cakey. And you can find it at pretty much any drug store! Milani Baked Blush – I’ve always loved baked blush and this one is really great for the price. My favorite color is the Dolce Pink, but I tend to like a brighter blush. Elizabeth Mott Color Is Bae – This is my go-to glass-lacquer for everyday wear (do not read that as I wear make up every day, more like once a week). My favorite shade is Moxie Muave, it’s the perfect warm pink that’s great for day or night. Rimmel London Provocalips – Ladies, if you’re looking for a lip color that NEVER dies, this is it. I first found out about this product two years ago in Hawaii when one of the girls wore it and hiked, ate, and sweat and it didn’t budget. I was impressed. I love the Heart Breaker color, but be warned, this stuff means business and it can take a good amount of elbow grease to get it off at night. Anastasia Beverly Hills Duo Brush #7B – If you’re going to be using a dipbrow pomade or an eyebrow powder, this is the brush you want! Sonic Cleansing Facial Brush – So you can spend anywhere from $10 to $200 on one of these, I’ve linked to the one I have and it works great. You can use it with any cleanser of your choice and it’s waterproof. This brush really does exfoliate your skin and leave it feeling smoother! Stippling Brush – Seriously, this thing will change your life! I’ve been using one for a little more than two years and I won’t apply my foundation with anything else. This leaves perfect streak-free airbrushed results! I have the Sephora 44 and it works great with my cream foundation but has many other uses as well. Hey Honey Trick&Treat Concealer – I’ve never been an overly big fan of concealer, probably because I’ve never had great luck with it. But I got a sample of this in my Ipsy bag last fall and instantly fell in love. Dark circles, acne scars, blemishes be gone! Hey Honey Take It Off Mask – I hate sunburns, but I LOVE peeling off the skin once it’s over (I know that sounds weird, but I also know I’m not alone) Well, this mask gives me the same satisfaction and leaves my skin feeling radiant and super soft! Smashbox Photo Finish Primer Oil – I never realized the difference a primer oil could make until I used one. That being said, it is expensive and I tend to only use it for special occasions, nights out, or photo shoots. When I’m not using the oil, I tend to go with my Too Faced Primed & Poreless Face Primer. Symphony Beauty Snow Cream – This is my go-to moisturizer, but it tends to leave a bit of a residue over time so I usually only use it at night and wash my face in the morning. This is a great product for sensitive skin, it’s not greasy at all, and it leaves skin feeling super smooth. Farmhouse Fresh Lotion – I personally don’t really love lotion, but this stuff is amazing! It smells amazing, it’s made with amazing ingredients, and it feels amazing. Not at all greasy and it’s long lasting! The body milk and hand creams are truly magical products and there are so many different fragrances to choose from! Bliss Micro Magic – I’ve been using this product for a while now and I usually use it once or twice a week to exfoliate my face. I’ve noticed a huge difference in my skin since using it, it’s not as dry and has a lot more glow. A bottle lasts me more than a year. Native Deodorant – With all of the studies showing relationships between aluminum and breast cancer and Alzheimer’s, I wanted to switch to an aluminum free deodorant that didn’t smell too “granola” and worked amazingly, this is it! I love the Vanilla Coconut scent but they have several others as well. Duffy’s Craft IPA Shampoo – Yup, you read that right, this is a beer based shampoo and it is AWESOME! I’m not a beer drinker and I don’t really enjoy the smell, but luckily this smells closer to coconut or cinnamon rolls than actual beer. I’ve always suffered from a dry scalp and I’ve tried every shampoo under the sun to try and relieve it, but this one ACTUALLY works! I also try to wash my hair as little as possible and with this shampoo I can usually go 5 to 6 days before it needs to be washed. John Frieda Sea Salt Spray – There are some products out there where expensive doesn’t always mean better, and this is one of them. I mean, you can easily make your own sea salt spray at home and it will work just as well. But this is my store-bought go-to. It’s less than $10 a bottle and it lasts forever! I love their Frizz Ease line too. Living Proof Style Extender – This is often the only product I use after a shower, it’s great for when I’m just letting my hair air dry or when I plan on actually styling it. This hair primer repels dirt and oil and I think it’s partly responsible for me have to wash my hair so little. I always buy it on Amazon because it’s about $8 cheaper on there than at Ulta. A little bit goes a long way even if you have long hair like mine. Living Proof 5-in-1 Styling Treatment – Different than the extender in that this focuses more on the shine, volume, and conditioning of the hair. I love them both equally and often add a dime-sized drop of each to my hand and run it through my hair from root to ends. Both products are good for all hair types too!